Our son was privileged to take chemexplained.com last year during his senior year. The teacher is brimming with enthusiasm for the class and makes it interesting with his thorough explanations, real-life illustrations, and constant interaction on the chalk board. The format is easy to “rewind” and see again for more thorough understanding. 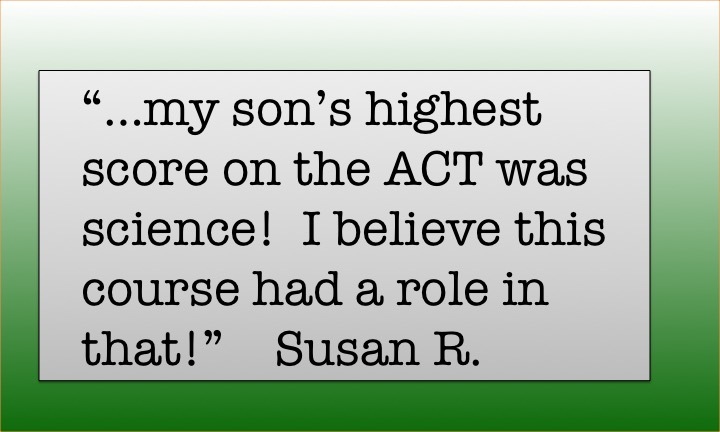 This class prepared our son to do well in his first year of college engineering courses. We highly recommend this course to any homeschooler looking for an understanding of chemistry. It’s not easy, but is so worth the time it takes to do it well. Cindy O. from Minnesota. After taking the SAT the fall of my senior year, I began Mr. Risbrudt’s chemistry course. Having tried several times to learn the subject from other sources, I was wary of beginning yet another course, but as I started listening and watching the podcasts, Mr. Risbrudt’s engaging personality and passion for chemistry made me excited about it as well. His style of teaching is such that a formerly complex and impenetrable problem is broken down into easily understood pieces, which can then be quickly solved. 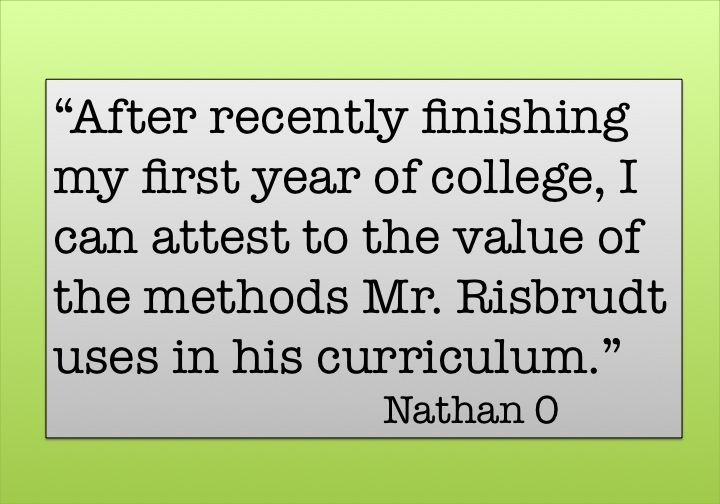 After recently finishing my first year of college, I can attest to the value of the methods Mr. Risbrudt uses in his curriculum. Knowing how to use “Risbrudt Brackets,” otherwise known as the “Railroad Track Method,” has been extremely valuable in my recent college experience. This world-class method allows one to solve complex problems quickly, easily, and without the confusion of excess notation. I have grown to use it so much that I have become known at my school as “The Unit Master” because of my preference for the cancellation of units. Mr. Risbrudt explains the fundamental principles and concepts with a skillful and experienced technique, so that even younger students can understand as well. When watching the podcast for LeChatelier’s Principle from Chapter 17, my 13-year-old cousin was able to follow along, understand, and correctly answer which direction the position needed to shift to keep the reaction in equilibrium. I wholeheartedly recommend this course because of its uncomplicated format and layout, intelligibly explained concepts, and in-depth approach to a formerly daunting subject with which I now feel far more comfortable. The course is not elementary or easy, so to speak, but with enough work and dedication, much can be learned and carried forward for future use. 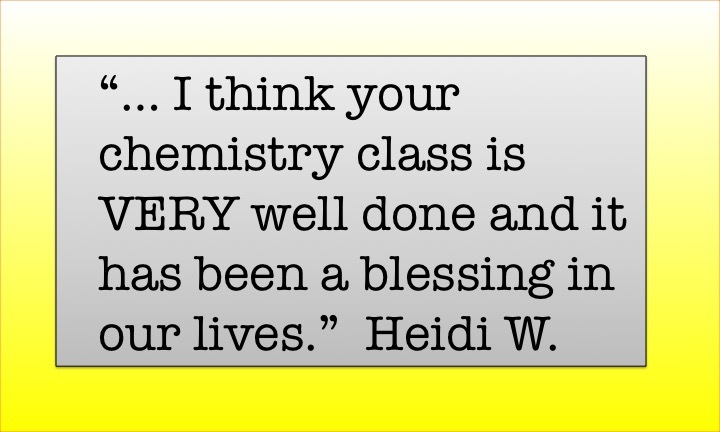 Thanks for making chemistry fun and enjoyable! Having been a home schooling parent for many years with numerous children completing high school, we have tried many different science programs. Chemistry was a course we found to be a challenge. When I first saw Chemexplained, I was impressed by the layout of the course. Chemexplained proved to be just what it is titled: chemistry explained in a systematic tutorial with video lectures and worksheets allowing the student to work through chemistry at his or her own pace. Our child actually enjoyed learning chemistry. JR. This was the class that pushed me the most and challenged me beyond what I thought was possible. Looking back I realized how much this class helped me gain confidence in myself. I feel that without having a class like this, my career choice [of being a chiropractor] would have been different. Without this confidence in myself, I never would have made it through 8 years of college. I am so thankful for a great teacher like Mr. Risbrudt that helped shape me into who I am today. 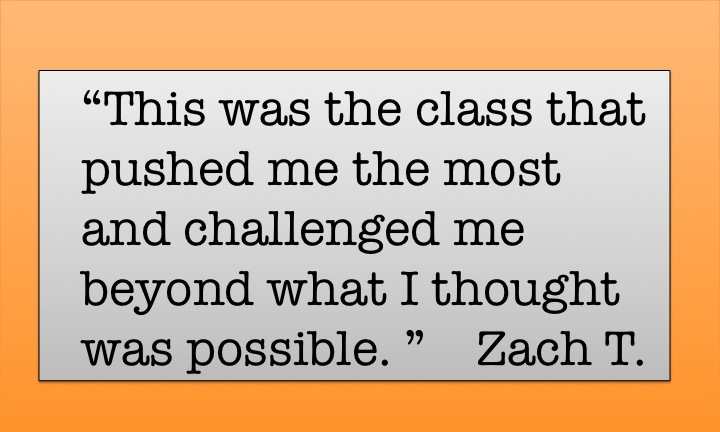 Zach T.
Mr. Riz, Thanks you for everything you do! Without your class, I still wouldn’t know what I wanted to do for a career. You always believed in me, and made me realize I can accomplish whatever I set my mind on Thanks again for being the best teacher I’ve ever had. Emily R.
I really want to thank you for opening my eyes to the best subject ever! 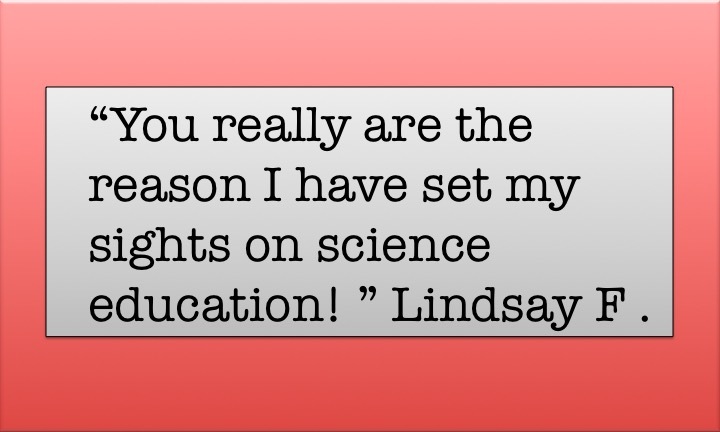 You really are the reason I have set my sights on science education! Thank you for being such a great teacher and inspirational person in my life. 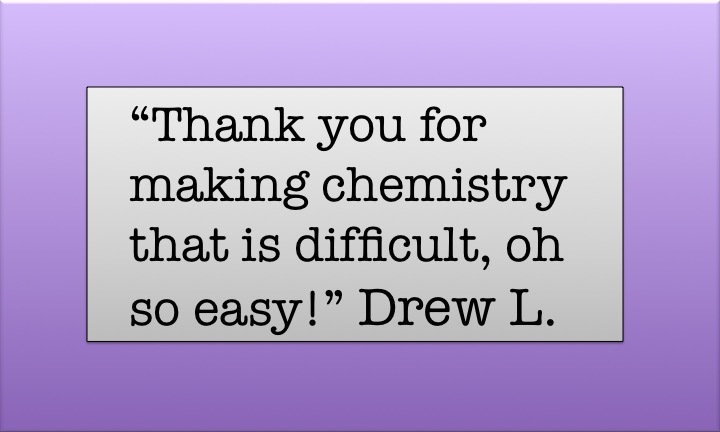 Lindsay F.
Thank you for making chemistry that is difficult, oh so easy! Drew L.
Thanks for making chemistry fun! (Don’t listen to the whiners!) 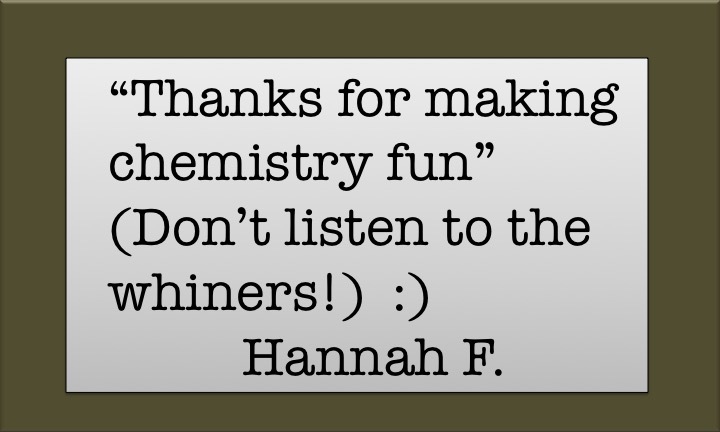 : ) Hannah F.
Thank you so much for being an awesome teacher! 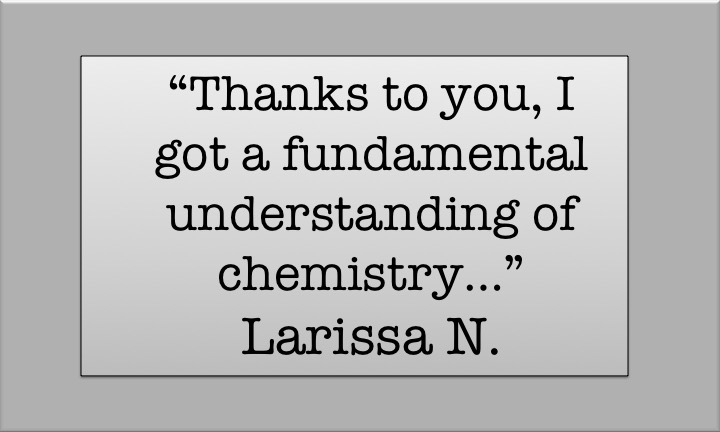 Thanks to you, I got a fundamental understanding of chemistry that in three years, no other teacher was able to accomplish. I am taking chemistry right now in Germany. We are studying organic chemistry and everything I learned in your class has helped me a lot!